Are you the type of person who ants a shoe that has a personality of it’s own? 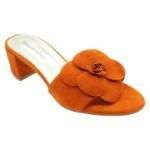 Gofor is a Orange suede slipper that features leather, synthetic and suede detailing. She’s the quirky one, the aunt that dresses in 70’s vibes, the friend who lives in the thrift store and she would suit your sense of style if your style is as unique as she is.